Again, there's very little controversy here. The scientific literature is quite clear that humans have caused most of the global surface warming over the past half century, as the 2013 IPCC report stated with 95% confidence. Guys this is really bad. It would be better if you just focused on the facts. This does not do anything to address the issue: "Thus it's perhaps not surprising that Cook et al. (2013) and its 97% consensus result have been the subject of extensive denial among the usual climate contrarian suspects. After all, the fossil fuel industry, right-wing think tanks, and climate contrarians have been engaged in a disinformation campaign regarding the expert climate consensus for over two decades. For example, Western Fuels Association conducted a half-million dollar campaign in 1991 designed to ‘reposition global warming as theory (not fact).’"
And under "The 97% Consensus Is a Robust Result", you start by citing a study that produce a 75% consensus level -- but you don't tell us that. You cite that study without even revealing the figure, which does not support the claim in your headline. Also, it was a study of abstracts, not scientists, so it's unclear why you think we can mix the two. The other 97% finding you cite is based on 77 people, which you don't mention. There is no survey of scientists that gives us 97%. The Cook study was about papers, and you make no mention that most of the papers included in the consensus were coded by human raters as implicitly endorsing AGW. Nor do you mention the substantial disagreement between the raters, or the fact that the disagreed upon observations were still included in the results. Try to find your 97% there. Severe outcomes are endorsed by less than half of the sample. Phronesis, the 2004 Oreskes study found 75% of papers explicitly or implicitly supporting the consensus, 25% taking no position, and 0% contradicting the consensus. Thus, amongst papers expressing any view that study found 100% support for the consensus. Your claim that it found only "a 75% consensus level" is a logic error on your part. If you count papers which don't address the issue at all you could bring in hundreds of thousands of papers on quantum physics, stellar cartography, economics, sociiology, et cetera and claim that since none of these take any position on global warming there is less than 1% support for it... or any other subject you want to dismiss via blatantly flawed logic. "Do you think human activity is a significant factor in changing mean global temperatures?" That question is closest to the proposition tested by Cook et al (2013). That low figure is because most scientists asked were not specialists in the relevant field, and consequently had little more knowledge on the topic than any non-scientist. Of the small portion of the those surveyed who were specialists in climate science, and actively publishing in the field so that they had up to date information, 97.4% agreed with question 2. There were only 77 of those, but they were part of a much larger sample. Turning now to Farnsworth and Lichter (2012), we find that it is a survey of scientists, 50% of whom were members of the AMS, and 50% of whom were members of the AGU, and all of whom were listed in the American Men and Women of Science. Their 489 respondents are therefore comparable to Doran and Zimmerman's 3,146 respondents, not to the 77 publishing specialists in climatology. Further (the relevant fact Phronesis did not reveal), only 41% of those 489 actively research in any aspect of global climate science. It is not clear how those 200 scientists compare to Doran and Zimmerman's classification. For Doran and Zimmerman, and active publisher must have published at least 50% "... of their recent peer-reviewed papers on the subject of climate change". That is, by a reasonable measure, at least 50% of their research must be on the topic. In contrast, the 200 scientists from Farnsworth and Lichter need only have actively researched on any aspect of climate science, ie, greater than 0% and need not have brought the research to publication. Nor need they be specialists in climatology. They are probably best equated with Doran and Zimmerman's active publishers. For the other 289, however, the closest category would be Doran and Zimmerman's non-publishers/non-climatologists. "In your opinion, is humanly induced global warming now occuring?" Assuming Farnsworth and Lichter's non-researchers resonded at the same rate as Doran and Zimmerman's non-publishers/non-climatologists (ie,76.6% affirmative), that represents 221 affirmative responses. That leaves only 190 affirmative responses to come from Farnsworth and Lichter's researchers, meaning that 95% of them responded affirmatively. Given the low bar on expertise set by Farnsworth and Lichter, and the strong correlation between expertise and current topic knowledge and acceptance of AGW found by Doran and Zimmerman, that 95% is surprisingly high. It shows, however, that the results of Farnsworth and Lichter is entirely consistent with those of Doran and Zimmerman, and also of Cook et al, (2013). Phronesis may rightly reject the assumption that Farnsworth and Lichter's non-researchers affirmed AGW at the same rate as Doran and Zimmerman's as speculative. The implication of that, however, is that no comparison can reasonably be made between their results and those of Doran and Zimmerman because they do not survey groups with the same demographics. Farnsworth and Lichter would then provide information about general scientific acceptance, but not specifically about acceptance by those with specialist knowledge in the field. Thus, less than half (but only just less than half) think the results of current climate trends will be catastrophic, or near catastrophic. Slightly more, but still less than half think the results will be moderate, while only 13% think the results will be trivial or near trivial. Hi guys. One thing at a time. We have no idea what the Oreskes study did. There is no methods section in the paper. The paper is only a page long, and the part that actually deals with the study is only 126 words long. We're told that papers that were classified as explicitly endorsing, evaluating impacts, or mitigation proposals were lumped together as endorsing the consensus. That's all we know. Note that the fact that a paper evaluates impacts does not imply endorsement or might report small impacts. We just don't know. We can't do anything with a paper when we don't know how it was done. We also can't be converting 75% to 100% based on a paper that includes unspecified implicit criteria for inclusion into that bucket. Your logic is sound except for the implicit part. I'm not going to infer unanimity via an implicit classification scheme, much less a complete unknown classification scheme. Is this controversial? Also, maybe your logic isn't sound after all. 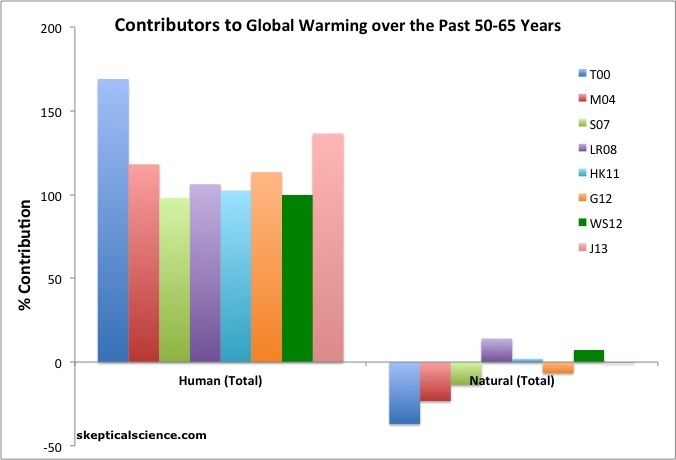 Let's linger on the fact that these figures are converted into "75% of climate scientist agree", or as you would have it, "100% of climate scientists agree". How did we get there? Papers. And we ignored papers -- and scientists -- who expressed no position (by the completely unknown filtering and coding protocol Oreskes used). The sample was much smaller than Cook -- I'm not sure why. There would technical papers, heads-down so to speak, that would address narrow issues -- not really at the level of abstraction of human caused climate change, which is pretty high level. Am I correct in assuming there'd be all manner papers related to climate mechanism that would not ever have occasion to use the relevant phrases? We don't know anything about what those scientists think. We only know about the set that were included and rated by methods we have not been apprised of. That makes me even more reluctant to say anything definite, certainly not that 100% of climate scientist think x, y, or z. Let me know if I've missed supplemental materials on Oreskes. I didn't see anything. Lastly for now -- we need detailed questions, nuanced views. Endorsement of the proposition that humans impact the climate or contribute to warming or are the primary cause of warming is not useful. Not if we want to do something with this knowledge, like pass laws and so forth. We need severities, probability and confidence, scientists' views on the likely roles of different forcings and feedbacks, interpretations of the pause in mean global surface temps, estimates of consequences and benefits of warming, etc. Obviously a 1 F warming by 2100 probably doesn't justify major increases in the costs of energy, for most people. I know the lower bound of IPCC 5 is higher than that, but I'd like to know what scientists think. I'd also like to see studies they have the opportunity to just express their judgments in their own words. Rater independence is crucial in a study based on rater data. Phronesis @4 & 5, it is more than a little hypocritical to not respond to one issue on the basis of limited time "one thing at a time", and then to yourself introduce additional side topics. It strongly suggests your intention is a gish gallop, where you introduce topics that are rhetorically convenient, but plead time constraints to avoid having to answer on issues where you have been shown to have been both hypocritical (leaving out relevant information, while complaining about what you consider to have been relevant information having been left out) and to misrepresent the study you quote. Here I linked two very recent reports (both less than one month old) from the National Academy of Science (and the Royal Society of England) and the American Association for the Advancement of Science that state clearly what they think about AGW. Both of these reports state clearly that AGW is likely to be extremely severe and that strong actions need to be taken immediately. For your convienence I have linked them again below. These reports state exactly what you claim above you need to make decisions. What is your issue with these clearly worded reports from the top science organizations in the USA and England? All other Academies of Science in the World agree with these three organizations. The problem is that you have not bothered to try to find out what scientists clearly say. Phronesis #1: "...you start by citing a [Oreskes] study that produce a 75% consensus level"
Phronesis #4: "We have no idea what the Oreskes study did." So you've gone from claiming that the Oreskes study did something it provably did not, to claiming that we just can't know... even though you originally claimed we did know. With respect to your desire for information regarding the severity of global warming impacts, etc. - read the IPCC Assessment Reports. That is their purpose. Phronesis... I don't want to pile on here but would just like to offer one suggestion. When a scientist gets his hackles up over some published finding, usually the response is to test the results him/herself. This is something you can easily do yourself. You don't need to review 12,000 papers. Honestly, Cook et al was way overkill in regards to what is statistically necessary to establish the point. There are two easy ways to do this. Here on the SkS site, you can rate abstracts yourself! If for some reason you don't trust the system that SkS has set up, that's fine. Just go to google scholar and start pulling up papers. Set up your own spreadsheet to check the results. You can get a rational statistical sampling with a couple hundred papers. That might take a few hours to process. But then you know for yourself with data created by someone you trust. You! Guys, has anyone responded substantively to anything I said in my last round? I don't see anything. Tom Curtis offers an insight about my intentions, that it is a "gish gallop". I don't know what that means, but I assume it's not charitable. Dunkerson says that I mentioned Oreskes' 75% figure and that I later mentioned how we have no idea what was done in that study (because the paper doesn't tell us). I take the argument to be that the number of problems I've discovered with Oreskes, or the order I in which I've presented them, somehow refutes me? Honeycutt regrets piling on another irrelevant, non-substantive reply, and talks about Cook. I had asked a question about whether the Cook et al study used independent rates, as stated in the paper. Honeycutt doesn't answer that question, but invites me to start rating abstracts. It would have been fair, if you would have told your readers that this was written in the article." "I never claimed to have “discovered” anything in the SKS forums. I didn’t claim anything I said was a secret or new. Quoting one source doesn’t indicate other sources were silent on those topics." So, right from the start much of Schollenberger's criticism consists of describing processes described in the paper, carefully not mentioning that fact, and then going "tut-tut". There is a small measure of validity in his criticism, however. Some (5-10) abstracts were discussed in the forum, and should not have been in order to preserve independence. To calculate the effect of this, I shall assume that 50 abstracts were discussed, and that all of those were rated as endorsing the consensus. Both of these assumptions are known to be false. However, they are conservative. That is, they will massively overstate the impact of the breakdown in proceedure on the paper. To estimate that effect, I simply reduce the number of endorsing papers by 50. The result is that the level of endorsement from abstract ratings falls from 97.1% to 97%. That is, this breakdown in procedure at most overstated endorsements by 0.1%, and did not change the headline result. It is very probable that the impact was negligible, because I have significantly overstated the number of papers involved, because not all papers involved were rated as endorsing the concensus, and because even of those endorsing the concensus, there is a high probability that the rating would not have changed to neutral, or not endorsing the consensus without the discussion. Further, this breakdown in proceedure cannot effect the author ratings which also show a 97% endorsement rate. Now, the question for you is - did you realize these facts before raising the issue? If not, why did you raise it, given as you claim to be pressed for time? Phronesis... My point is substantive if you care to entertain the idea. What I'm telling you is that you can cast stones all day long, never hitting a target and convince no one, including yourself, of anything. If you have genuine questions about what the reality is regarding the consensus of the published research, test the results yourself. Just be ready to adjust your position on this issue when you do. My guess is, much like everyone I've ever argued with who rejects AGW, you're not really interested in the reality of the situation. You're merely interested in testing your throwing arm. Sloganeering, DB? More like Hubris ad Absurdum. A few hours of careful work requiring no special equipment and Cook et al could, in principle, be falsified. Several people who question our work seem to have put lots of effort into writing blogposts, examining our statistics, submitting formal rebuttals, making FOI requests and writing angry letters to all and sundry. Yet, if they were right, a convincing knock-out punch would be easy to deliver, just by looking through a random sample of scientific papers on climate change. But this work has not even been tried, or if it has, it hasn't been reported. It is interesting to learn that you know more about scientific opinion on AGW than the American Association for the Advancement of Science. I am sure other readers will make their own choice about whether they should believe the AAAS or a nameless voice on the internet. This is a scientific board. People are expected to provide evidence to support their claims. Peer-reviewed evidence is best. You do not appear to care about evidence. You might find that your method of argument is better received at one of the skeptic sites where they do not care about evidence either. To guide the What We Know initiative, AAAS convened a group of prominent experts in climate science. Though Shaviv also admitted that Cook et al. correctly classified his abstracts based on their content, but claimed that he worded the text in a way to slip it past the journal reviewers and editors. Is there some other statement by Shaviv I may have missed where he clearly says he agrees with the Cook et al rating of his abstract? The main reason I ask is because I recently checked out the Schulte consensus paper (that overlapped with Cook et al), and saw that it had categorised the Shaviv paper as rejecting the consensus. I then checked its Cook et al rating and was surprised to see it was instead classified as endorsing the consensus. I would have agreed witht the Schulte rating and although the abstract is rejecting the consensus. Or at least not supporting it. This last past part of the Shaviv absrract seems to put it outside. Subject to the above caveats and those described in the text, the CRF/climate link therefore implies that the increased solar luminosity and reduced CRF over the previous century should have contributed a warming of 0.47 ± 0.19°K, while the rest should be mainly attributed to anthropogenic causes. Without any effect of cosmic rays, the increase in solar luminosity would correspond to an increased temperature of 0.16 ± 0.04°K. Doesn't the above key passage clearly indicate the paper holds a thesis that there is a greater proportion (>50%) increase in recent temperature rise that is not explained by anthropogenic causes and so puts it clearly outside the consensus? Uncomfortable as it makes me, I have to agree with tlitb1 on this one. In partuclar, in stating that he understated his claims in the paper to get past peer review, Shaviv did not state that the claims in their understated form did not reject AGW. Further, in the abstract, Shaviv clearly asserts a climate sensitivity of 0.35 K/W/M^2 (equivalent to 1.3 C per doubling of CO2), and asserts that solar effects including indirect effects through changes in cosmic ray intensity are responsible for 0.47 K of the increase in temperature over the twentieth century. Using AR4 figures, that is 0.47 out of 0.7 K. Both of these should have been sufficient to classify the abstract as rejecting AGW. The Shaviv paper just happens to be one of the demonstrably small number of mistakes in classification in Cook et al. It is silly to think that a project like the Consensus Project would be mistake free. What is remarkable about the project is how few the mistakes were, and how little impact (if any) they have on the headline result. I'm glad you agree with me about the Shaviv assessement. My attention was only drawn to Shaviv because I had just for the first time read the Schulte paper, which itemises 6 papers (including Shaviv) as examples rejecting the consensus, and I picked Shaviv to compare first. "However, the extent to which anthropogenic factors are the main cause of global warming is still being debated." "we propose a new hypothesis for global warming." by rights should be enough to define this abstract as *not* being in the consensus. The Shaviv paper just happens to be one of the demonstrably small number of mistakes in classification in Cook et al. It is silly to think that a project like the Consensus Project would be mistake free. I certainly wouldn't expect Cook et al to be mistake free but I have to say finding a disagreement between 2 of the 4 overlapping examples here in the Schulte paper, a paper which Cook et al itself draws attention to, is quite interesting; interesting because I think the two examples also indicate an insight as to why they were mis-rated, and why more papers could be too. I think the mis-rating of Lai et al. (2005) could be explained if the raters were slavishly only looking for quantification, and not really parsing any deeper, then at a push I could see it being put in the neutral category, however its being rated in the endorse category still seems wrong. And again with Shaviv, there is some dispute about the 'wording' indicated in the article above, as if it wasn't playing by the rules, i.e. as Dana Nuccitelli implies above, "he worded the text in a way to slip it past the journal reviewers and editors" . But surely if Shaviv did not lie in his abstract, no matter how it was 'worded' , Cook et al's methodology should have been robust to correctly rate it? It clearly seems not in this case, could that have happened in more cases? tlitb1 @20, sorry, my computer ate my long response, so you will have to make do with the short. 1) I agree with you about Lai et al (2005), which I would rate as (6) "explicitly rejects but does not quantify". 2) From the full rating data, which has been released by John Cook, it can be determined that there is an initial rating error rate between "endorsement levels" of 12.9% on average, which results in an expected error rate between levels after dispute resolution of 4.7%. Given that distinctions between "implicit" and "explicit" are graduated rather than binary (things can be more, or less explicit) such an error rate is unsurprising. It is also overstated in that it treats a large number of ratings of "0" (= uncertain) as errors, which is not the case. 4) Despite the low overall error rates, the sheer number of endorsing abstracts means a small fraction will have been incorrectly rated, ie, should have been rated as rejecting the consensus. On the figures above, we would in fact expect two such abstracts. Those figures show only internally detectable errors, however, so the number may by slightly larger. 5) Because we expect some such errors as a matter of course, no amount of highlighting single abstracts being correctly rated will show the Cook et al results to be false. That is because such anecdotal evidence does not provide a basis for statistical analysis. At most the response required is to adjust the values reported for endorsement and rejection in Cook et al by the number of individual abstracts found to be in error. Thus, you have found two abstracts in error. Therefore we would adjust the Cook et al figures of 3896 endorsing and 78 rejecting to 3894 endorsing and 80 rejecting, which changes the percentages (as a percentage of papers endorsing or rejecting) to 97.99% endorsing, down from 98.04%. Even that ignores the probable existence of papers with errors in the other direction, and makes no difference worth mentioning. Even if you were to find a net error of 100 abstracts in favour of endorsement, after correction you still have an endorsement rate of 95.52%, which again is not a challenge to the Cook et al result. 6) Because of this, the only valid method to challenge Cook et al is to do another survey yourself, of at least 2000 abstracts (and prefferably more). Make sure you state your classification criterion clearly. You will find either a result within 5% of the Cook et al value, or your classification criteria will be transparently tendentious. likeithot... Then Mike Hulme is welcome to replicate the research and show everyone how he believes it should be done. As it is, Cook13 confirms all the previous research on this topic, including Oreskes04, Doran/Zimmerman09 and Anderegg11. He actually gives several examples of how the "study" could have been done. 1.For starters, hire some independent people to actually review the abstracts. 2. create a definition of AGW that is actally meaningful, like for a paper to count as supporting AGW it would need to actually state that, and state the degree to which they think humans are responsible, more than 50%, or less, for example. This is obviously crucial, as most scientists don't deny warming or that CO2 has some effect. The debate is about how much of an effect, as they undoubtedly knew and avoided in order to be able to forward their political adgenda. [PS] Read the comments policy. Compliance is not optional. Future violations are likely to result in the comment deleted rather than snipped. likeithot said... "He actually gives several examples of how the 'study' could have been done." How about we change the scare quotes to "...how the study 'could' have been done." To my point once again, if Hulme has ideas on how the study could be done better, then by all means, let him do what scientists actually do in these situations where they disagree. Replicate the study. If it can be done better, then do it better! I would suggest that the vast majority of those critiquing Cook13 don't want to replicate because they know they're going to come up with the same result. In fact, you too can replicate the study, likeithot. Right here on this website. We've created a tab at the top where you can rate abstracts yourself. So, spend a few hours doing it. Maybe you'll come up with different results. If so, you can let us all know. Anything short of that is, as they say, just belly-aching. You didn't respond to any of the points I made regarding how the study should have been done. In short, it is poorly done because it avoids the critical question of the whole debate: HOW MUCH of the warming that we have witnessed is becasue of human activity. Almost no one argues that humans have had no impact, so disproving that is just knocking down a straw man. As to your suggestion that I re-do the "study", I find the whole point of the study to be political in nature, trying to prove a scientific point by some kind of opinion poll and then bragging all over the press that your opinions are right because you claim to have lots & lots of people on your side. I have no interest in popularity contests. It is a sign that your arguments are weak, and a distraction from the fact that most models are very inaccurate and didn't predict the pause in warming of the past 17 years. (Rob P) - Readers will note that the strike-through text relates to other climate myths dealt with here (Climate Models Show Remarkable Agreement with Recent Surface Warming) & here (Nuccitelli et al. (2012) Show that Global Warming Continues), for instance. likeithot if you want a different question answered, then perform a survey of your own. However, if you want to ask how much of the warming we have witnessed is because of human activity, then you are basically only looking at papers that specifically address the question of attribution. Fortunately, there is a report that already summarises th litterature on this topic (chapter 10 looks like a good place to start). "As to your suggestion that I re-do the "study", I find the whole point of the study to be political in nature, trying to prove a scientific point by some kind of opinion poll"
nobody is claiming that the existence of a consensus on a scientific question is in any way proof that the mainstream position is correct, that is a straw man. The point is to provide evidence of what the mainstream position on the science actually is. Why is this point worth addressing? Because there is a gap in the public perception of the mainstream position and the reality. This is explicitly mentioned in the article, so it is hard to understand how you have misunderstood the purpose of the study. If you want evidence that the science is right, the IPCC AR5 WG1 report is a good place to start. likeithot - While the paper could have been more explicit with each individual endorsement level description (at the risk of some repetition), reading the set of exclusive choices as a whole and the guidelines used for evaluations clarifies that endorsement levels of 1-3 are for a majority anthropogenic influence, while endorsement levels 4-7 are for minority or negligible anthropogenic influence. The levels are in fact quite clear on that. You can only claim a lack of attribution levels in the Cook et al paper by ignoring the context of the multiple exclusive choices presented - in essence by taking things out of context. That's an error on your part, and on the part of many who have criticized the paper. As to trying some ratings yourself, that's a suggestion made because you (and any critic) have some options available regarding this paper and the consensus. If you think the Cook et al raters were biased in their work, do some ratings yourself - a few hundred from the evaluation set should be managable in a weekend day, enough to see if the 97% estimate is supported by the abstracts evaluated. Otherwise you're criticizing w/o evidence, hand-waving. That's one of Tols errors. If you agree with the general consensus level, but are just criticizing the methods used in Cook et al, then you are by your very agreement with results not able to argue rating bias. This is another core error in Tols comment. If you disagree with the level of consensus entirely, with Doran, Anderegg, Oreskes, and Cook et al, you need to provide some independent evidence, i.e. do the work. Or you're again engaging in unsupported hand-waving. There really aren't any other choices wrt this paper. In regards to consensus vs. science - the consensus is not the science, but rather is driven by the science, by the available evidence and data. As in any public policy issue, no one person is expert on everything (although some people act like they are, oddly enough) and we therefore rely on expert opinions. And as noted in the Cook et al paper, the gap between the existing scientific consensus and the public view of that consensus (due in large part to signficant ongoing efforts at obfuscation and misinformation) means that our public policies will be misinformed as well - unless and until that misperception is corrected. Claims that a scientific consensus on climate doesn't exist despite multiple studies or even cursory looks at the literature, or that expert opinions are meaningless, are really just efforts in denial, and attempts to halt reality-driven public policies. I consider such claims to be wholly ideological rather than evidential. And (IMO, mind you) I regard your claims in this thread in like manner. If you wish to argue public policy, great, do so, although I suspect SkS is perhaps the wrong place for purely political discussions. But policy discussions need to be based on accurate information, including the reality that the vast majority of people studying climate agree on the basics of AGW. For those unhappy with Cook et al., there are some issues that need to be addressed. If you agree with the overall level of consensus, you cannot claim the Cook et al. raters were biased. If you feel the raters were biased while ignoring independent results, the Cook et al. data (the abstracts) are publicly available - do the work and support your claim, or drop it as opinion and not fact. If you disagree with the overall level of consensus, provide some evidence. Or again, hand-waving opinion unsupported by facts. Again I (IMO) view arguments against the consensus, made without evidence, to just be efforts to influence public policy - trying to persuade the public to ignore evidence, to ignore reality. likeithot... Every single paper or piece of research ever done, and every one that ever will be done, can be done better. That's just a fact of life. I will take from your combativeness and unwillingness to test the results of Cook13 as an admission that the results are likely to be correct. In the interests of remaining on topic, I'll just note (as many others have) that public policy decisions are driven by the information available, that on complex subjects we depend upon expert opinion, and that due to some rather serious efforts by 'skeptics' there is a gap between the expert opinion and the public perception of the same. Consensus is very important in informing policy. I will also note that your "look, squirrel" changes of subject mean that you have not supported any of your claims against Cook et al's methods or results. How do you think policy should be guided? Personally I think that in highly technical areas, policy should be guided by the consensus of experts. It might be wrong, but that is still the best way for policy makers to proceed. Of course you need to know what the consensus is and interestingly, several ways of examining this have arrived at the same conclusion. If you dont think that this is the consensus opinion, then where is your evidence to the contrary? I think the idea of group-think in science is total joke. "Science is a contact sport" is more realistic - and utter applies to Lindzen's example which was clearly not group-think. Actually it is example of politically-motivated abuse of science much like the anti-AGW stance which is rather ironic. Otherwise, the piece consists of misinformation that Lindzen would certainly not say to his peers and the usual political argumentation method of selective historical presentation to support an argument. How about showing a little skepticism for this sort of stuff and checking it against the actual science yourself? What Lindzen publishes in journals gets noted. What Lindzen presents to the naive is rather different and depressing. Eugenics was not the scientific consensus opinion by a very large margin. Democracy would work okay if the population was actually accurately informed but as you are aptly demonstrating, people prefer to get their "information" from sources which confirm preconceived beliefs. Spare us the strawman arguements please. You obviously read a pack of pseudoskeptic sites, why not read what the science is actually saying and predicting instead of the nonsense that would appear to fit your prejudices? Have you ever look at the IPCC WG1 report? It would appear not from those statements. As a post-script, I have a pretty clear of set of criteria for data that would falsify climate theory based on what climate theory actually predicts. - OHC flat or declining while known net forcing same or increasing. - sealevel rise declining over a 10 year interval. Do have a set of criteria for changing your mind? There are some soi-disant skeptics who don't respect the IPCC but do respect the US National Academy of Sciences. Those people might learn something from the 36-page booklet Climate Change: Evidence and Causes, jointly published by the NAS and the Royal Society of the UK. It should be considered to represent, for what it covers, the scientific consensus on AGW. likeithot said... "...Lindzen is a highly recognized scientist with a lot more published science than all of those who work on this site combined." So, let me get this straight. One scientist presents a position you like, so that trumps 97 other equally qualified scientists who disagree with him? Look, no one says that the 97% are absolutely right and the 3% are absolutely wrong. That's not how science works either. But, when it comes to making critical policy decisions you have to have a reference for how to make those decisions. What are the chances the 3% are right and the 97% are wrong? I would suggest that, even if the figures were 50/50, that would be more than enough reason to take aggressive action on climate change. If there were a 50/50 chance my house was going to burn down if I didn't get the wiring replaced, you'd be darned sure I'd be making that investment asap. likeithot - Your most recent reply contains several logical fallacies, namely Argument from Authority (while Lindzen is a climate scientist, he is in a distinct and tiny minority on his views, with multiple papers debunked), Red Herrings (eugenics), the Argument from Uncertainty regarding the maturity of the field. You also have Gish Galloped false claims about extreme weather, sea level rise rates, and the temperature record. From your posts it appears you, in fact, are the person who has been spending too much time in the echo chamber - deep in denial myths. At this point it's clear to me that you are simply trolling, and are not interested in a rational discussion of the data and science. I would suggest that the correct response is DNFTT (Do Not Feed The Troll). I would also point out the accusations of " sycophant research" is simply empty rhetoric - a dismissive to hide that fact that there is no counter-theory, and at odds with the mass of hard data collection that is the core of climate research. FF companies have the scientists, the money, computer power and the motiviation to find alternative theories. Instead they invest in PR. Why do you think that is? Perhaps because of what their own scientists tell them? I work in petroleum science - denialists are rare among scientists. "We examined a large sample of the scientific literature on global CC, published over a 21 year period, in order to determine the level of scientific consensus that human activity is very likely causing most of the current GW (anthropogenic global warming, or AGW)." no you do not determine that level. because according to you data, there would have been a 87% consensus and not 97%. because you then change the consensus position to include unquantified statements. "To simplify the analysis, ratings were consolidated into three groups: endorsements (including implicit and explicit; categories 1–3 in table 2)"
so people, carefull when you use that study as a source, the study shows that 97% of published studies state that human activity cause some warming. the paper does not show that 97% of the scientific literature on climate change support the conclusion that human activity cause MOST of the warming since mid 20th century, as is falsely claimed in the paper. how did this pass peer review? Otherwise you should already be aware that one important aspect of the rating done for the paper (and actually mentioned in it) is that any wording minimising anthropogenic warming would have made the abstract go into one of the rejection categories, thus ruling out the inclusion of "human activity cause some warming" in categories 1 -3.
they included papers that did not quantify the Anthropogenic contribution to warming. and when you check the abstracts of for example endorsement level 3, you find that they did count unquantified abstracts as supporting, thus the claim in the intro of the study is false. I note that Aanthanur @41 subsequently went on to cite as example the paper Beyea et al. 1991. But Beyea very clearly states implicit support for the mainstream science of AGW. And thus the paper goes more correctly into "Category 3" — and yet Aanthanur fails to recognize that categories 1 - 3 all endorse the scientific consensus (contributing to the quoted 97%). The Beyea et al. paper is all the more remarkable for being published in 1991. Being 26 years ago, and at the start of the survey period. Since that time, the consensus position, already extremely strong, has gone on to become even stronger (and has no valid challenges to it). So Aanthanur's preoccupation with allocation to category 1, 2, or 3 . . . is a complete waste of time. Furthermore, Aanthanur displays unawareness that the Cook et al. 2013 paper provides a double validation of the 97% consensus (authors gave a self-rating of their own papers — and the self-ratings verified the 97%). It should also be noted that the average age of the papers in the Cook survey, is now around 10 years old. With the march of time and further evidence, a renewed survey would show consensus above 99%. "Aanthanur fails to recognize that categories 1 - 3 all endorse the scientific consensus "
they use different definitions in the paper. one is quantified, the other not. you cannot use unquantified abstracts to evaluate the support for the consensus as defined in the introduction, the one in the abstract yes. and i have no problem with a 97% consensus. or 99%. the data used in this study, is not supporting one of the two definitions given in the paper. i do not doubt AGW in the least, AGW is an observed fact. I picked just one randomly, the specific paper is rather irelevant, if old or if correct or not, what matters is, if it has a quantified attribution in the abstract. In this world, we have (A) the realities, (B) our human concepts of the realities, and (C) the language of words which we use to describe & handle the concepts. The nexus between realities and concepts can be valid or poor . . . or even nonexistent. Likewise our words can be useful tools in "handling" concepts . . . but in some cases they can be a handicap, or even completely divorce us from understanding the appropriate concepts & underlying realities. Aanthanur, I very much fear that you have allowed your "Motivated Reasoning" to lose you in a forest of words — and distract you from looking at the realities. The main game is the reality of a rapidly warming Earth : ice melting, sea level rising, oceans acidifying, surface temperature rising . . . all in a harmful way (and with worse to come). And the causation of it all, is clear. The "consensus" connects us to the scientific understanding of the [AGW] . . . and you harm yourself by diverting your mental focus toward a forest of verbal trivialites. i do not hurt myself. what hurts me is when AGW deniers get ammunition, and it was a denier that pointed this out to me. and i had to agree. but you seem to not care much about accuracy. i do care, i want to use accurate data. and Cook et al is not accurate. and i hate to be debunked by deniers. and i guess others feel the same. hense my warning to other people debating AGW deniers. Aanthanur - if you haven't done so yet (which your recent comments seem to imply as they cover old and well-trodden grounds) please read KR's comment upthread from June 2014. If his first two paragraphs - esp. the mention of "exclusive choices" - don't clarify the rating guidelines for you, then nothing will and we can just as well stop any discussion right here. If you haven't done so, you should also take the time to actually read all the information provided on the TCP-homepage I link to in my comment @40 above (which includes the various articles related to Cook et al. (2013) and subsequent studies). It's been more then 4 1/2 years now since the paper was published and the likelihood to come up with something, which others haven't yet used to attack the paper with, is as close to zero as it can possibly get. Basically, you seem to have been taken in by one of the characterstics of (climate) science denial which is "impossible expectations". The denialist you are referring to is playing word games with you while at the same time misunderstanding the rating guidelines himself (and it doesn't much matter if he does so intentionally or not). "12270,2011,3,3,Wood pellets production costs and energy consumption under different framework conditions in Northeast Argentina"
read the abstract, there is no way to know from the abstract aone if that study attributes 40% of the observed warming to anthropogenic source or if the attribute 140% of the observed warming to Anthropogenic sources of GHGs. i did read everything avaible on this website on this. and i still thik it is wrong. i also wrote to the jouranal. the wording is misleading. yes the "expanded" the definition to include unquantified abstracts, but then they should have changed the sentence in the introduction that claim they evaluate the support for the more than 50% consensus. i will use Verheggen 2014, they also came to the 87% conclusion. and include the important point about aerosol cooling that is masking parts of the warming. not the case here, this is not an impossible expectation. it is simply an error in a paper, and all it needs is change one sentence, that is not impossible. ""We examined a large sample of the scientific literature on global CC, published over a 21 year period, in order to determine the level of scientific consensus that human activity is very likely causing most of the current GW (anthropogenic global warming, or AGW)."" ""We examined a large sample of the scientific literature on global CC, published over a 21 year period, in order to determine the level of scientific consensus that human activity is very likely causing GW (anthropogenic global warming, or AGW)." or just use Support Level 1 and 7 and have a 87% consensus. Aanthanur - that abstract states "[..]The development of cleaner and renewable energy sources are needed in order to reduce dependency and global warming. Wood pellets are a clean renewable fuel and has been considered as one of the substitutes for fossil fuels.[...]". With that wording it clearly falls under "3.1 Mitigation papers that examine GHG emission reduction or carbon sequestration, linking it to climate change" so, - under our documented rating guidelines - is an implicit endorsement of AGW (and it's called "anthropogenic" for a reason, namely for humans being the main and not just a "minor" or "one of many" causes). If you prefer other definitions, feel free to conduct your own study and get it published.